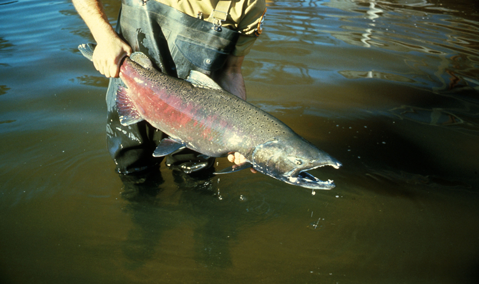 Chinook salmon (Oncorhynchus tshawytscha). Image courtesty U.S. Fish and Wildlife Service. The Puget Sound Ecosystem Monitoring Program (PSEMP) is a collaboration of monitoring professionals, researchers, and data users from state, federal, tribal, local government agencies, watershed groups, businesses, and private and volunteer groups. The objective of PSEMP is to create and support a collaborative, inclusive, and transparent approach to regional monitoring and assessment that builds upon and facilitates communication among the many monitoring programs and efforts operating in Puget Sound. PSEMP’s fundamental goal is to assess progress towards the recovery of the health of Puget Sound.